This summer marks the eighth year that the Food Bank of Central & Eastern North Carolina has administered Kids Summer Meals programs. We work together with partner agencies across our 34-county service territory to ensure that children in low-income areas continue to receive nutritious meals during long school vacations when they do not have access to school lunch or breakfast. 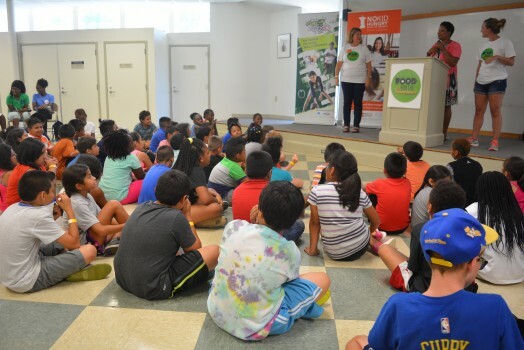 Food Bank CENC sponsors Kids Summer Meals by providing meal sites with breakfast and lunch at no cost. Community-based organizations operate these meal sites at schools, churches, and youth centers. Together with 180 meal sites, we have served nearly 180,000 hot meals to more than 7,300 children as of mid-August. Children gathered for Food for the Summer event at Hargraves Community Center. Photo via Blake Hodge. “The food bank is a sponsor for the summer feeding program and what we do is provide the food and administration for the sites,” Weidig said. Weidig says the lull in organized programs before school starts can be harmful to children’s nutritional needs. Weidig says by partnering with Food for the Summer, the food bank acknowledges that the summer months can be a difficult time for families. Thank you Food for the Summer for helping us reach NC children this summer!